Returning to Netflix with his monthly interviews, American household name David Letterman sits down with Beyoncé's husband Jay-Z for lessons in flow, hip-hop culture and the criminal justice system. This 2009 biographical mob drama stars Johnny Depp as a notorious bank robber during the great depression, adapted by Michael Mann from Bryan Burrough's non-fiction book Public Enemies: America's Greatest Crime Wave and the Birth of the FBI 1933-34. It follows the story of notorious American gangster John Herbert Dillinger. The final episodes of Mad Men track the time from January 1969, a few weeks after Thanksgiving, to November 1970 as the madhouse advertising creatives and their families see out the era in the style and debauchery that came to epitomise the series. Da da, da da, da da, da da.... can you hear the music? The very first Blockbuster and major Steven Spielberg break-out movie, Jaws is swimming its way onto Netflix. No doubt Meghan Markle's engagement to Prince Harry has boosted the profile of Suits in the UK. Nonetheless, there's a reason the show was popular in the first place. Season seven sees Louis terrorising his associates following his messy break-up and a series of departmental power plays, as only Suits can do. Most importantly of all, the second half of season seven is Meghan Markle's final episodes as an actress before she gets written out. Heartwarming and depressing in equal measure: this charming Netflix film 6 Balloons follows one woman as she drives across LA with her heroin addict brother on the hunt for a detox centre, all with his young daughter in the back. Starring Abbi Jacobson, Dave Franco, Tim Matheson and Jane Kaczmarek. You're going to need tissues. Following his third failed attempt to enlist in the US army, a try-hard misfit takes the advice to 'protect the homefront' too seriously and disappears with a young runaway and attempts to form an anti-terrorism unit. Season ten of the fabulous – and bitchy – Rupaul's Drag Race comes to Netflix with all the glitter and hijinks necessary for a good season. Following on the back of its chilling crime drama Mindhunter, Netflix returns with another psychologically challenging thriller – this time set in Victorian-era New York, and starring Dakota Fanning and Daniel Brühl (Inglourious Basterds). A criminal psychologist teams up with a journalist and police detective to investigate a series of gruesome murders of young boys – expect a gripping but grisly tale of depravity as the trio hunt down a serial killer. Chris Hemsworth and Charlize Theron star in this prequel (and curiously also sequel) to Snow White and the Huntsman, a dark fantasy world in which forbidden love and a fight for survival against evil take centre stage. Written and starring the very funny Tina Fey, Whisky, Tango, Foxtrot is the real-life story of an American journalist working overseas in Afghanistan. If Tina Fey wasn't enough of a pull for you, W.T.F (see what they did there?) also stars Margo Robbie. Set in a futuristic world in which humans colonise space, this sci-fi series follows a family whose plans for a better life are disrupted when their journey goes awry, and they end up stranded lightyears from their intended destination. Finding themselves in a hostile and wildly unfamiliar environment, they must fight to survive and make it home. Adam Sandler and Chris Rock doing what they do best – an uncomplicated, feel-good comedy. Two fathers with totally opposing personalities are forced to spend time together in the run up to the wedding of their children. Moments of confusion, awkwardness, and hilarity ensue. 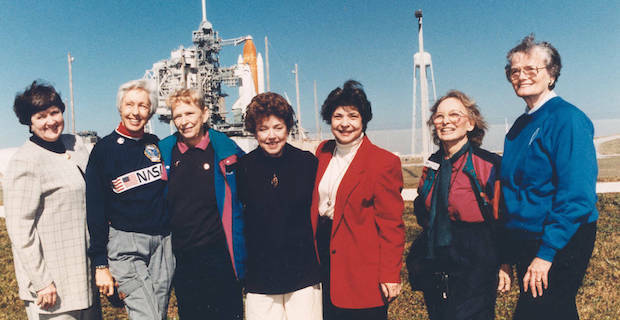 Seven members of the Mercury 13 in front of their shuttle in 1995. Ever heard of the Mercury 13? Find out why you haven't. Netflix brings us a documentary that tells the story of the thirteen American women that passed the gruelling tests for spaceflight in 1961, but were barred from NASA's astronaut programme because of their gender – unlike their male counterparts, the infamous Mercury 7. This is a remarkable story of pioneering women prevented from following their dream. 'He's not the messiah. He's a very naughty boy.' The beloved Monty Python films, plus a number of their sketches, are coming to Netflix with all their silliness. Ram Dass was one of the most significant spiritual teachers and cultural leaders of his time. In this lyrical documentary, he reflects on life, love, suffering and the soul as he nears the end of his life and prepares for death. Poetic musings are interspersed with intimate and sensitive cinematopgraphy. Netflix has cooked up a brand new edition of award-winning Chef's Table, a series which transports us into the kitchens of renowned chefs across the world – this new spin-off focuses specifically on pastry chefs.